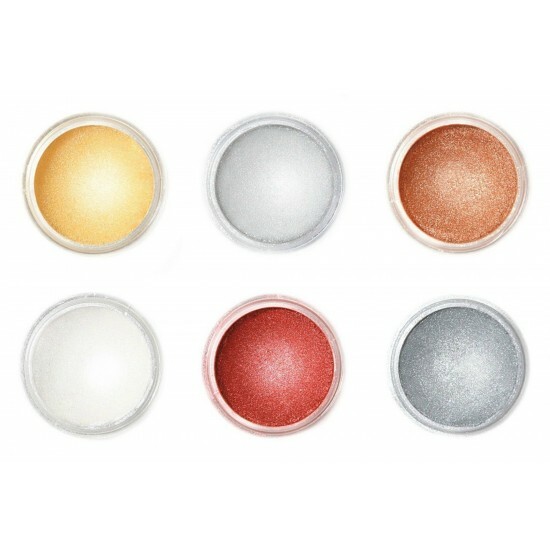 Add shine to your fondant gum paste or chocolate creations. Easy to use, just brush onto your decoration with a soft brush. To paint decorations, pour a small amount of Quick Dry paint base; stir in dust and brush onto your decoration. Barco Quick PaintAdd to powders or lustres to create a paint for smooth and even application to edible items like fondant, gumpaste and chocolate.&nbs..
Rolkem Quick Dry Essence Add to powders to create a paint for smooth and even application to edible items like fondant, gumpaste and chocolate. ..
Cake Decorators Rose Spirit - 95% alcohol, 1% rose spirit.Mix with lustre or colour dusts to create a paint. Can also be mixed with edible paints to t..
Barco Chocolate Paint Base Add to powders to create a paint for smooth and even application to edible items like fondant, chocolatePerfect for use wi..
Roxy and Rich Fondust - Neon Blue4g jar Fondust can be used to colour sugarpaste/fondant, modelling paste, florist paste, marzipan, almond paste,..
A little goes a long way with LorAnn's Super Strength Flavors! Lorann's super-strength flavors are 3 to 4 times stronger than grocery store extrac..
Plaque Cutter8 x 6cmUse for cookies or fondant/gumpaste plaques on cakesTin Plate..
Fractal FunDustic colour dusts are versatile colouring dust, suitable for a wide range of edible uses!Fractal dusts can be used in different ways, dep..
Fractal SuPearl Shine dusts are versatile lustre dusts, suitable for a wide range of edible uses!Fractal dusts can be used in different ways, dependin..
0.1oz bottle. Give your fondant and gum paste decorations a beautiful, glittering finish! Wilton Pearl Dust creates rich, lustrous highlights on ..
Give your fondant and gum paste decorations a beautiful, black glittering finish with Wilton Black Pearl Dust edible accents! Pearl Dust edible accent..